Even though Marathon Petroleum slightly missed earnings this past quarter, it's still a great business poised to succeed once it completes its major acquisition. For the past couple of quarters, Marathon Petroleum (NYSE:MPC) has been posting incredible results as it benefits from a North American oil and gas market working in refiners' favor. While the company still benefited immensely from these trends in the most recent quarter, it wasn't quite as good as in previous quarters, and the company missed lofty analyst expectations. For investors wanting to look beyond one quarter at a time, the real story worth following is the closing of the deal to acquire Andeavor in October. While the deal didn't make it into this quarter's numbers, you can bet it will have a large impact from here on out. So let's take a brief look at the company's most recent report and see what else we can expect. DATA SOURCE: MARATHON PETROLEUM EARNINGS RELEASE. Refining is a business that rides the market's ups and downs. The prior quarter was about as good as it can get for a refiner with incredibly fat refining margins. By all accounts, this past quarter was pretty good as well, but it didn't quite live up to prior quarters. Marathon also noted that its turnaround and maintenance expenses for the quarter were about $0.50 per barrel higher than this time last year. It sounds like a small amount, but the company refines more than 2 million barrels per day, so over a whole quarter those per-barrel costs add up quickly. Another thing to keep in mind is that the company completed a major dropdown transaction with subsidiary master limited partnership MPLX LP (NYSE:MPLX) in February. The deal moved about $230 million in operating income from its refining business to its midstream segment. Data source: Marathon Petroleum. Chart by author. Despite the slight earnings decline, the company still generated $1.2 billion in cash, which allowed it to repurchase $400 million in shares on top of its dividend payments. One thing to keep in mind when looking at these results is that they don't include any contribution from the recent acquisition of Andeavor. The deal closed on Oct. 1, so we'll get a better idea of what the combined company looks like in the fourth quarter. For the past few quarters, CEO Gary Heminger has been rather quiet about the Andeavor acquisition, since it was still awaiting regulatory and shareholder approval. Now that the transaction is complete, he was able to explain some of the benefits we can expect from the combined businesses. On Oct. 1, we closed on our transaction with Andeavor. Both sets of shareholders demonstrated overwhelming support, as we are now the leading integrated downstream energy company in the U.S.
You can read a full transcript of Marathon Petroleum's conference call. Considering all the touted benefits of this integration, management seems to think the Marathon/Andeavor combined business has hit the ground running and will turn out great results in the fourth quarter. From an investor's perspective, though, we'll have to wait and see. Integrating businesses this large will involve a lot of one-time costs that are likely to hit the bottom line this upcoming quarter. Overall, things are looking up for Marathon Petroleum. The refining market is still working in its favor, and it's still getting respectable results from its Speedway and midstream segments. If it can integrate Andeavor rather painlessly, then the company's most recent stock decline seems unwarranted. 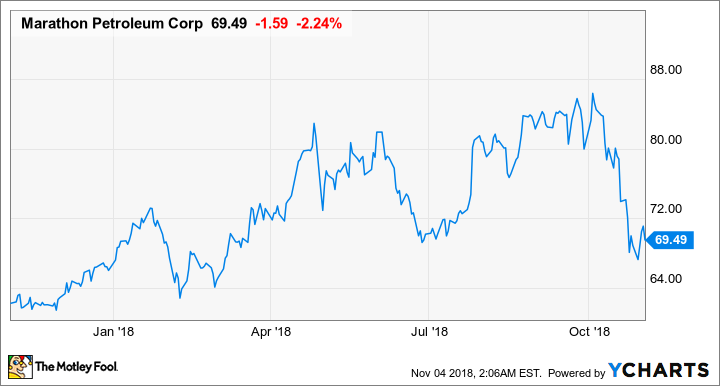 While I'd like to see what the results of the combined company look like on paper, there is reason to believe Marathon's stock is a good buy today.